The Madagascar Hissing Cockroach (Gromphadorhina portentosa), also known as the Hissing Cockroach or simply just Hisser, is one of the largest species of cockroach, growing up to 3 inches in length (7.6 cm) at maturity. They are found in rotting logs on the island of Madagascar off the African coast. There are at least 20 known species of large hissing Cockroaches in Madagascar. They are not winged like most Cockroaches, although they are excellent climbers and can scale smooth glass. Males can be distinguished from females by their thicker, hairier antennae and the pronounced "horns" on the pronotum. Females carry the ootheca (egg case) internally, and release the young nymphs only after the eggs have hatched. As in some other wood-inhabiting roaches, the parents and offspring will commonly remain in close physical contact for extended periods of time. As the name suggests, the Madagascar hissing cockroach is characterized by its hissing sound, produced when they force air through the respiratory openings (spiracles) found on each segment of their abdomen. The Madagascar hissing cockroach is one member of a group of roaches that can all hiss; this exact mode of sound production is, however, atypical, as most insects make sound by rubbing together various body parts. In hissing roaches, the hiss takes three forms: the disturbance hiss, the female-attracting hiss, and the fighting hiss. 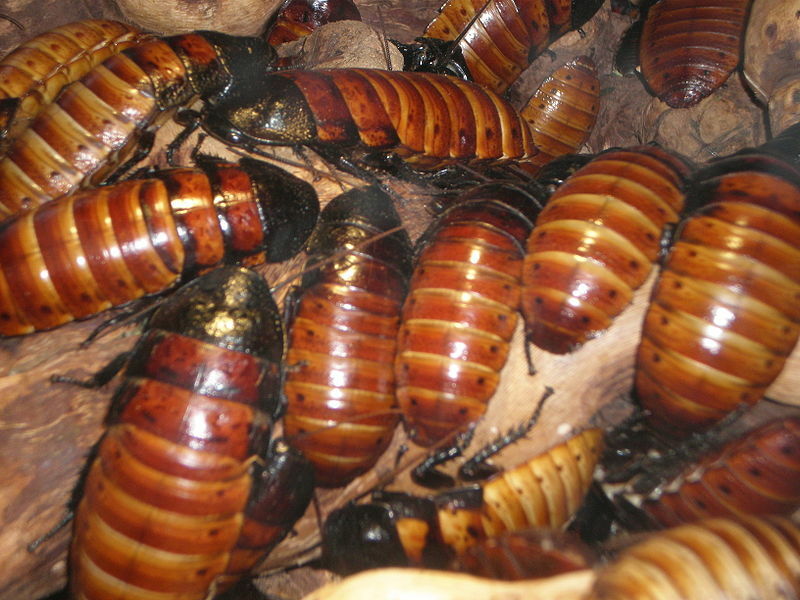 All cockroaches from the fourth instar (fourth moulting cycle) and older are capable of the disturbance hiss. Only males use the female-attracting hiss and fighting hiss; the latter is used when challenged by other males (males will establish a dominance hierarchy, and a submissive male will back down to end a fight). Click HERE for a Madagascar Hissing Cockroach care sheet.